In recent years, trampolines have become very popular additions to backyards across America, and for good reason. Apart from being great fun, trampolines are a fantastic form of exercise for young and old. If you're thinking about purchasing a trampoline for your own family, you'll want to be sure that your trampoline is great value for money, high-quality, and most importantly safe. If you've spent some time researching trampoline models, then chances are you're familiar with the Giantex brand name. Giantex manufacture a range of trampolines and related products, and have built up a good reputation in the industry. So, is a Giantex product the right choice for your family? We've been doing our research, and have produced a handy guide to Giantex products so you have all the information at your fingertips. 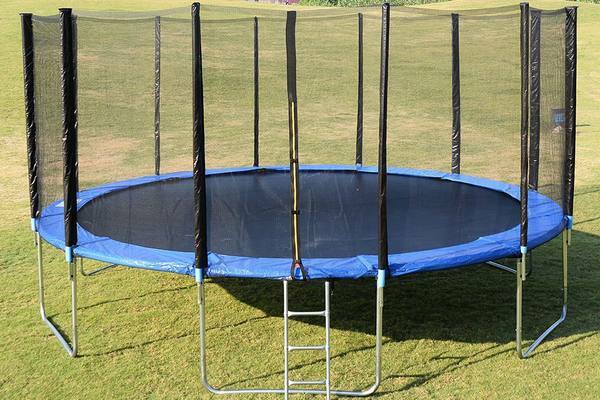 Read on for our Giantex trampoline review. What are the weight limits of Giantex trampolines? If you're purchasing a trampoline, then it's highly likely that children will be using it at some point. As a result, safety will be of particular concern. The Giantex Trampoline Combo Bounce aims to improve safety by providing a net enclosure, ensuring that users cannot fall from the trampoline. The legs of the trampoline are in a U-shape underneath the body. Therefore, this improves the stability of the trampoline, ensuring it remains still during use. 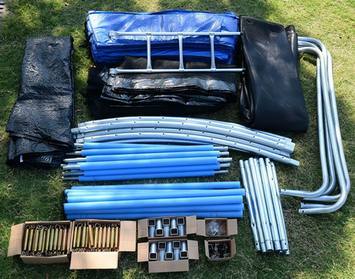 The trampoline comes with all the component parts you need to assemble and use it straight away. These comprise a steel ladder, safety enclosure net, mat and frame. ​Soft foam sleeves and a safety enclosure are firmly attached to the frame where the springs are joined. As a result, there is no gap around the edge, which is a big plus as users cannot fall down the gap. The frame is made of galvanized steel, which has been treated to resist rusting. This makes the frame highly durable, extending the life of the product. Like its larger counterpart, this trampoline includes a foam padding on the frame so that it doesn't hurt if you fall on it, Also, there is a built-in safety net to provide extra safety during use. This model is extremely lightweight, making it easy to move around if you want to change your trampoline placement. In addition, it is fully collapsible so you can fold it up and put it away when it's not in use. The zip-up door provides extra safety, so your kids can't fall out of it whilst bouncing. 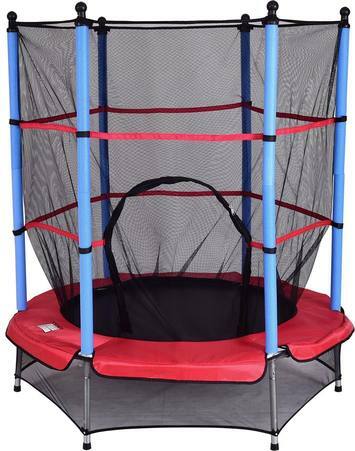 This rebounder trampoline is another great option if you're short on space, or if you want to use your trampoline indoors. Unlike the previous models, there is no safety net, although there is a large handle to hold onto to prevent falls. 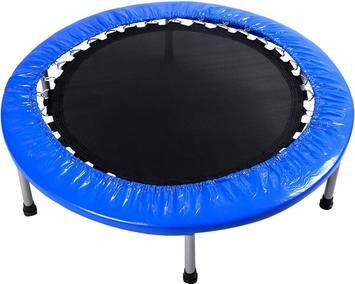 This 22 inch trampoline is intended to use for keeping fit, allowing use as part of a fitness program at home. 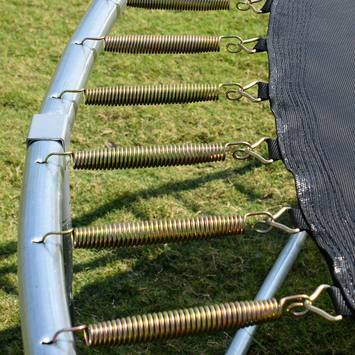 As a safety feature, this trampoline includes an adjustable handle, so you can steady yourself during use. ​The frame is padded with foam around the edge, providing a cushion to reduce the likelihood of injury during use. The frame is strong and sturdy with stainless steel, providing a good level of durability. In order to protect your floors, the leg tips have rubber tips, so you don't need to worry about scuffs or scratches. When you're purchasing a trampoline, it's really important to check the weight limit. If you are hoping to have a sneaky bounce on your trampoline when the kids aren't looking, you will need to purchase a trampoline with a weight limit that can safely accommodate an adult. Here are the weight limits of the three Giantex trampolines we're reviewing today. Giantex Trampoline Combo Bounce: This model has a weight limit of 375 lbs. This makes it a great choice if everyone in your family wants to have a go, as it will more than take the weight of an average adult. Giantex 55" Round Kids Trampoline: As a trampoline designed specifically for kids, this only has a weight limit of 100 lbs. While this should take the weight of most children, unfortunately for the grown-ups this will not be suitable for them. Giantex Mini Rebounder Trampoline With Handle: Although it has a lower weight limit than the Combo Bounce, it still has a 250 lb capacity, so should be suitable for most people. Giantex trampolines are designed to be easy to assemble, and come with a handy and detailed guide with pictures, to help you through the process step-by step. It is strongly recommended that you refer carefully to the guide to ensure assembly has been completed correctly. The Giantex 55" Round Kids Trampoline and Mini Rebounder Trampoline are collapsible, so once you've assembled them once they won't need to be taken apart if you want to move them. Instead, you can simply fold them up and store them away. User reviews tend to say that assembly is fairly straightforward, although some buyers say they have had problems unfolding the Mini Rebounder model. As they are made of galvanised steel, the trampoline frames are designed to be durable. Product reviews are largely positive when it comes to quality, and most users say that their trampolines have held up well over the course of time. There are a few reviews that say the steel tubing bent after use, but these are few and far between. Overall, it seems that you get a good quality trampoline for your money. We found locating replacement parts for Giantex trampolines pretty tricky, and they are not stocked on Amazon. There are some websites on the internet that specifically stock trampoline parts, however we were unable to find one that stocked a full range of Giantex parts. We love how the Combo bounce comes in such a wide range of sizes. This provides a suitable option for most yard sizes. The zip doors on Giantex's enclosures are a great safety feature, as they prevent children falling through them after an over-enthusiastic bounce! The steel, rust-resistant frames are a great feature, as this makes the trampolines very durable and increases their life. We like the inclusion of a ladder on the Combo Bounce, which makes the trampoline accessible to small children. Often, the risk of falling down the gap between the frame and the bouncing surface can be a major safety concern with trampolines. It's great that this has been addressed with the way the net enclosure is attached. The foldable frame of the 55 inch and Rebounder models make them a great option for families who don't want to commit to a full-size trampoline in their yard, but still want the benefits that owning one brings. Its a shame that replacement parts are not readily available. As trampolines tend to get a lot of heavy use, it's not unlikely that parts will need replacing at some point. It would be great if these could be purchased at the same retailer as the trampolines, to save hunting around on the internet. With the Combo Bounce, many users have reported having it mailed to them in several boxes as it is so large. This is obviously an issue if the boxes arrive on different days and you are waiting around to have a complete set! In conclusion, we believe that Giantex trampolines are good quality and represent value for money. Their range has been well designed so that there is a product to suit the available space of most households. Most importantly, these trampolines have excellent built-in safety features, so you can be confident that they don't pose a risk to children during use. If you decide to purchase a Giantex Combo Bounce trampoline, be sure to measure your yard carefully before you order, to make sure it will fit safely into the available space. Happy bouncing! 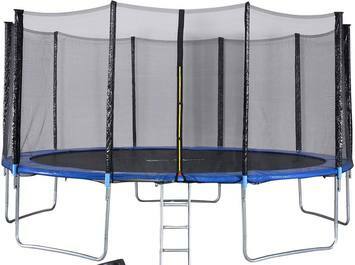 Click here to buy your Giantex trampoline from Amazon.com.